S01 Ventilation system has a wide range of circulation fans that have been designed to move the maximum amount of air, with as little noise and energy consumption as possible. These S01 fans have been designed for heavy-duty commercial/industrial use and will last for years. Versatile, adjustable mount provides for easy ceiling mounting, ceiling suspended or wall mounting. The fan motor is maintenance-free and highly energy efficient. Supplied complete with 5' power cord. Fan holes are larger, providing double the air circulation. Noise levels are low....well below OSHA requirements. 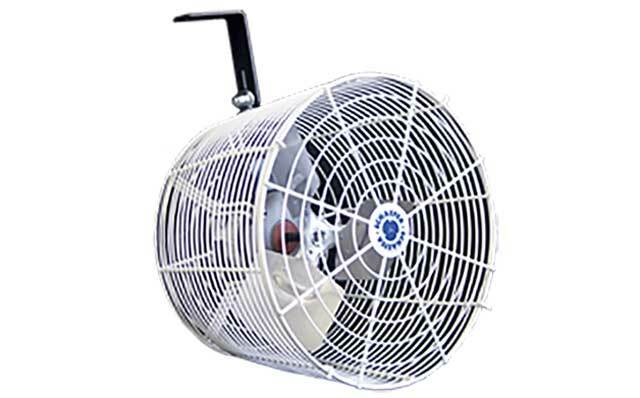 Fans can be ceiling mounted, ceiling suspended or wall mounted, thereby remaining out of the way of material-handling equipment and eliminating safety hazards. Improves comfort by enhancing the normal cooling process. Increases production and safety levels. Reduces equipment and building condensation problems. Provides an energy design for low cost operation. White epoxy housing prevents shadowing. 5' cord included with fans upto 24".